When you move into a flat/house with a boyfriend/girlfriend there's a lot you have to learn in order to accommodate the tastes of both parties, or so I've found out. Despite J saying that he'd give me free reign over the decorating I've recently been told that 'there's too much pink, Louise'. Naturally I protest, saying that he let me decorate and that is what I will continue to do. You subject me to FIFA all the time, I subject you to floral...comprende? Anyway, I love having little knick knacks around me, yet hate clutter. I think these little decorative hangings are a perfect way to add a little something to a door handle, to hang on the wall or to place delicately on a shelf without a room looking too cluttered. I've chosen three rectangular hangings and 3 heart shaped ones (there are so many heart shaped hangings in the world, they should have probably had a post all by themselves!). Number one is from Next and I, just as the sign says have fallen in love with it. It encompasses my personality really well, I'm in love with the idea of love and this would look amazing hanging from the end of mine and J's bed - so cute. The second sign is from Dotcomgiftshop and I thought it'd fit perfectly in the kitchen. Who doesn't love chocolate? The third rectangular sign is from Sass and Belle and again this one encompasses me entirely. Follow my dreams? Challenge accepted. The first of the heart shaped decorations, number four, is also from Sass and Belle and I thought that it is so cute and vintage looking - I love the pretty little hummingbird. Number 5 comes from a shop called Athena and I absolutely adore the beaded heart detailing on this little hanging decoration. I love one of these to hang on my wardrobe doors. Finally, number 6 is again from Sass and Belle, what a lovely way to welcome someone into your home...! 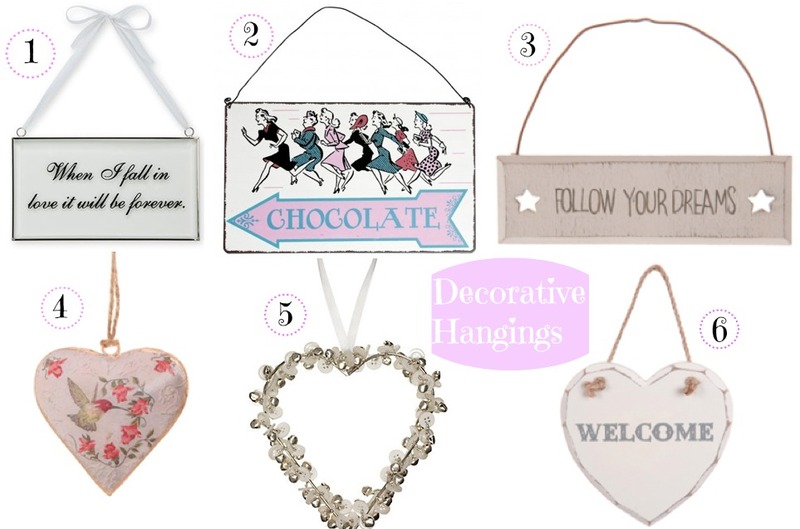 There are, of course, a multitude of other decorative hangings available and these are just a few of my favourites. Now all I need to do is to find lots of door knobs to hang them on...! Which of these do you like the look of? I love number 4, has a lovely vintage feel to it. I have never purchased from Sass and Belle but may take a look at what they offer as I have many of this decorative hangings. We seem to have the same taste. I imagine I would like your home very much. I have a metal one of these on my bedroom door which I love! I like the chocolate one, made me giggle!